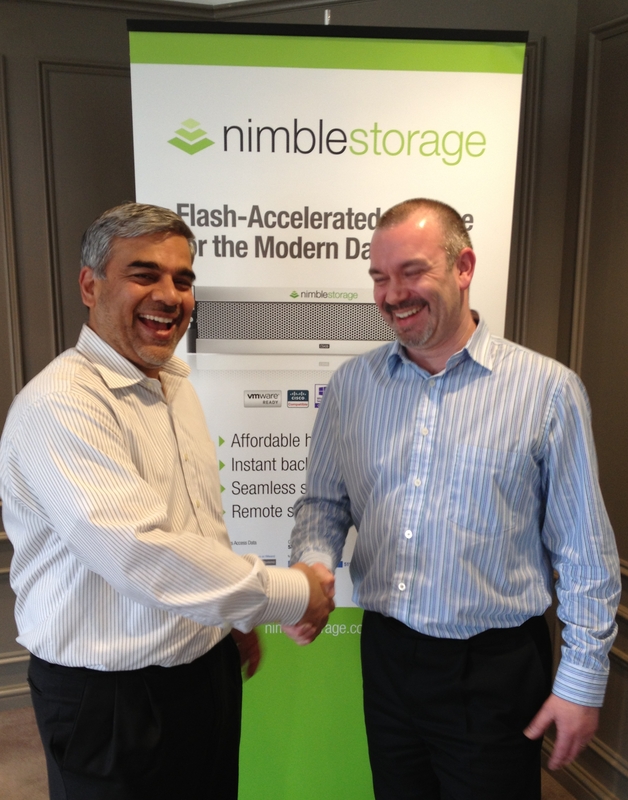 Taking in the best that the City of York, The Midlands and London had to offer, Nimble Storage UK hosted three events to showcase the leading Resellers and Customers in the UK and how they were leveraging the Storage Platform in interesting and unusual ways. This was the second event of the week, hosted at the beautiful Golfing Resort of The Belfry, Sutton Coldfield. In glorious sunshine and plush surroundings, Suresh opened the day by giving a short background to Nimble Storage and where he saw his company and the industry going over the next few years. The presentation stayed high level and covered the approach that Nimble took to the rapidly changing market place. Looking at where other companies got things right and more importantly, where they got things disastrously wrong. Learning from their peers and incumbent vendors, drastically influenced the design of the Nimble product line. Interestingly, he covered the layering effect of the IT industry, whereby successful technology platforms are used as a base for someone else to built upon. Storage Area Networks (SAN’s) are typically the bottom of the pile and as such are the key to a successful business. The fundamental issue with this approach is that as technologies evolve and become ubiquitous, such as SSD/Flash Disks, the traditional methods of reading & writing to this media need to be reviewed. Being the ‘new boy in town’ allowed Nimble to design a flexible product leveraging these technologies and ultimately design a new Storage Architecture called CASL. Looking forward to the future, we were given an insight to the SSD industry, the manufacturing issues, costs and where potential savings may come from. Ultimately, with the current generation of SSD’s the key to minimising the wear and extending the life of the product, is purely down to clever software management – something Suresh believes Nimble have got just right. Since July 2013 Transform Medical have been heavily involved in publicising our choice of Nimble Storage as a platform to support our business going forward. As Senior Systems Engineer, Nick Furnell was honoured to be chosen as the Guest Speaker on the day. “It is very rare that a customer gets the chance to talk directly to a Senior Manager of a Silicon Valley corporation, let alone to actually have the CEO’s ear during a 45 minute presentation – a once in a life time opportunity”. Nick retold the Transform “Journey” and the compelling arguments and business requirements that made them choose Nimble Storage over the other players in the market. Transform Medical’s chosen partner for this project was COOLSPIRiT, Chesterfield – they are a small, dedicated and friendly company who deploy Best of Breed technologies in to businesses large and small across the UK. This personal approach was key in Transform choosing them as long term strategic partner. The “No More Tiers Formula” tag line adopted by Nimble, could not have a better analogy than the way Transform utilise their CS220 Nimble Array. In partnership with Veeam Backup Software, the single 3U device is used both as a Primary storage array holding the company Live data and also as a Backup Target for archiving. The benefit of this muti-use platform is two fold – from the businesses point of view the investment in one technology not only reduces any training costs but also reduces cost; and as a consumer of the storage the IT Department can leverage all the capabilities of the product without compromise. Instead of paying for separate Storage and Archiving technologies, and their inherent trade off of licensed options. All the performance and reliability of the Nimble array can be brought to bear simultaneously. With built-in compression, “Lego style” upgradability and throughput driven by CPU cycles and not spindle count, these two fundamentally different business requirements (Fast Live Data & Backup/Archiving) can be handled with ease. The Nimble feature set allows for per-Volume based Storage Profiles, this “Fine Tuning” allows the creation of multiple Datastores, each with different Performance Profiles. Caching, Compression and Snapshoting can all be enabled independently – even different Block sizes can be defined on a per volume level. This is in stark contrast to the “Fat Tuning” process of Traditional Storage Arrays where-by you have to use a ‘crystal ball’ to look forward and assign RAID groups and Tiering levels at the point of ordering your SAN. Compromises are always made, over allocation of particular resources are the norm. Ultimately, when the space runs out on your High Performance RAID volume or SQL gives way to VDI in the data centre, you are forced to extend in to another storage tray and do the whole RAID guessing game again. Worse still some vendors insist on selling you a complete new Head Unit – none of this is necessary with Nimble Storage. The “Meet the CEO” day was a great event and just showed how committed the Board at Nimble are to meeting and exceeding customer requirements. How many other vendors would allow such unmetered access, and in fact, how many Senior Officers of Global Manufacturers would ever venture out into the real world of the customer. Many thanks to Nimble Storage UK, CoolSpirit and the other Resellers for inviting Transform and the other customers who managed to attend on the day.